The Matterhorn is probably one of Europe’s most recognised landmarks, visible from miles away. Chiseled distinctively by both time and the elements, the Matterhorn is shaped as a culminating pyramid, almost even on all sides. Technical climbing of the Matterhorn is a long-loved tradition luring many, from novices to professionals and is best arranged between mid-July and mid-September. Peak physical condition is necessary for those who want to participate in more than just a leisurely hike. An added benefit to visiting the Matterhorn is that there is year-round ski-ing there with nearly always pristine conditions. 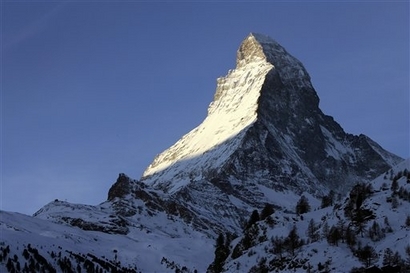 Many mountaineers have lost their lives climbing the Matterhorn. In fact the death rate is one of the highest for climbing in the world. Part of this is due to the fact that at any given time the sheer number of climbers on the mountain can cause rocks to loosen and become a threat to other groups. Mont Blanc, often thought of as the highest mountain in Europe, was pipped at the post by Mount Elbrus in Russia. However, Elbrus is relatively easy to climb, Mont Blanc is more of a challenge. The first recorded ascent was on August 8, 1786 by Jacques Balmat and the doctor Michel Paccard. This climb, initiated by Horace-Bénédict de Saussure, who gave a reward for the successful ascent, traditionally marks the start of modern mountaineering. The first woman to reach the summit was Marie Paradis in 1808. Now the summit is ascended by an average of 20,000 mountaineer-tourists each year all striving to stand on top of the roof of Europe and look down on all of the major summits of the Alps including the Eiger, Matterhorn and Monte Rosa. It could be considered an easy, yet long, ascent for someone who is well trained and used to the altitude. It presents one of the great challenges of the Alps, requiring a high level of fitness and adequate acclimatisation. However, every year the Mont Blanc massif takes many victims, and in peak weekends (normally around August) the local rescue service flies an average of 12 missions, mostly directed towards people in trouble on one of the normal routes of the mountain. Piz Roseg (pronounced as peetse rawzech) is a mountain in the Bernina Range between the two countries. Not enormously high, the south-east and higher summit is 3,937m and the north-west summit, known as Schneekuppe is 3,920m high. It does, however, offer some good and difficult climbing. There is also a prominent top on the east-north-east ridge, called the Roseg Pitschen at 3,868m. The first ascent of the mountain to the Schneekuppe was by F. T. Bircham with guides Peter Jenny and Alexander Fleury on 31 August 1863. The highest point of the mountain was reached two years later by A. W. Moore and Horace Walker with guide Jakob Anderegg on 28 June 1865. The 700-metre north-east face of Piz Roseg was first climbed by Christian Klucker and L. Norman-Neruda on 16 July 1890; the face – with a notable serac band halfway up – sports a number of difficult routes. Klucker, together with M. Barberia, also made the first traverse from the Italian side of the Porta da Roseg on 21 June 1898.
if there are a lot of climbers in this route, you could have a lot of waiting time in the rock passages but this will give you the chance to admire the great iceface! The development of “ski extreme”, which began between the world wars, has reached Piz Roseg as well. The terrifying northface was downhilled on skis by Kurt Jeschke and Martin Burtscher on 4 June, 1978. It is extremly dangerous. Heini Holzer, a very successful ski-mountainer fell to his death here in the Roseg-NE-face one year ago. The slightest mistake on this face will probably be your last one! Piz Badile is a granite mountain range in the Bregaglia range on the border between the two countries running along the summit ridge. It lies in a unique area of granite horns and spires reminiscent of the Cirque of the Towers in Wyoming. For big mountain routes, the Piz Bernina, Piz Palu and Piz Roseg all offer fantastic climbing, arguably better than many more well-known peaks to the north and west. And for alpine rock routes, there is no equal to the superb granite peaks of Bregaglia, a cluster of fantastic spires just west of St Moritz and the Engadinet. Its north-east face is considered one of the six great north faces of the Alps. The two classic routes on Piz Badile are the north ridge and the Cassin Route on the north-east face. The north ridge – the Badilekante – was first prospected solo by the Swiss guide Christian Klucker in 1892. After several unsuccessful attempts by Italian parties in 1911, the ridge finally fell to Alfred Zürcher with the guide Walter Risch on 4 August 1923. F. l’Orsa and André Roch found a more direct line on the ridge on the second ascent (18 July 1926). The most popular route on the north-east face is the Cassin Route so-called after the first ascentionist Riccardo Cassin, who climbed it with V. Ratti and G. Esposito, together with the Como team of Mario Molteni and Giuseppe Valsecchi on 14–16 July 1937. Molteni and Valsecchi were already on the face when Cassin and his party started out, but the climbers subsequently joined forces. In this famous alpine epic, Molteni died of exhaustion and exposure on the summit, whilst Valsecchi died on the descent by the south ridge just before reaching the hut.